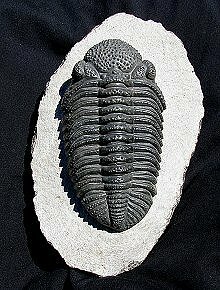 This is an extremely impressive trilobite fossil. It is a fabulous Drotops megalomanicus from the Devonian of Morocco. This trilobite was meticulously prepared under a microscope here in the EXTINCTIONS Prep Lab. This HUGE trilobite is extremely inflated and 3-dimensional and exhibits extraordinary detail. The thick-shelled exoskeleton is covered with hundreds of coarse pustules, and the individual lenses of the large compound eyes are practically flawless! The beautifully articulated bug has gorgeous natural color and contrast and is wonderfully displayed on the large, sculpted block of dense limestone. Every trilobite collector should have a Drotops of this quality in their collection - unfortunately, there just aren't enough good ones to go around.